Observed April 2012 in the Goldfield Mountains of eastern Maricopa Co., Arizona, USA. 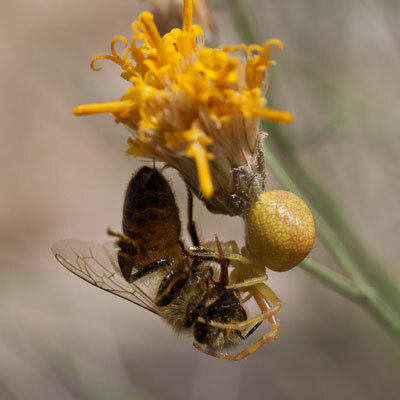 The prey of this crab spider is a Honey Bee that was visiting the flowers of Sweet Bush. Photo by A. Ostling. This photo was taken in April 2008 near Robbins Butte, western Maricopa Co. The prey item in its fangs happens to be another spider - a jumping spider (Salticidae). 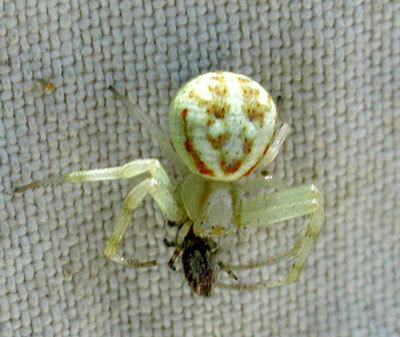 Misumenops crab spiders are sit and wait predators, i.e., they do not spin webs for capturing prey. Instead they wait on foliage, or better yet, a flower, and take insects, especially pollinators. The specimen at lower left was found on Allscale (Atriplex polycarpa) which lacks showy flowers. In this case the spider waits on new, fresh foliage where prey are likely to be encountered. 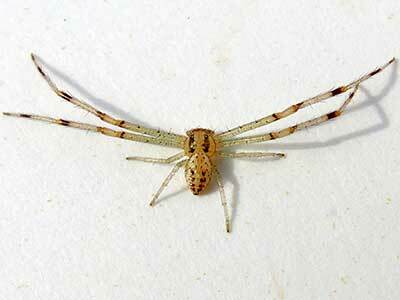 Crab spiders spin silk when constructing their egg sac and also for use in transportation. By emitting silk into the breeze the spider can climb along the strand once it entangles on a nearby plant. If the spider is small and the breeze stiff it can hang on to its silken kite and become airborne. This activity is called 'ballooning' and can disperse spiderlings over hundreds of miles. The spider with the bee appears to be using all eight legs to hold its meal and there is a line of silk securing the spider to its perch. Crab spiders can be distinguished by their eye pattern: eight small eyes in two rows of four each. The first and second pair of legs are rotated forward for capturing and holding prey. In crab-like fashion they often crawl sideways. The adult males are very different looking. The long legs and slender build are suited better to traveling and encountering male or female conspecifics. On ocotillo at Ajo, Arizona, USA. 11 March 2016.